Flowplus16 is a high precision fluid pressure monitor device (up to 16 bar) designed from concept to exactly fit medical device criteria by including the standardised Luer-Lock connector system and internally, a void free flow channel coated with a virtually inert FDA compliant elastomer. In particular, the universal single size Luer-Lock system enables equipment manufacturers to combine almost all related devices with each other. This means that the flowplus16 may be instantly connected to syringes, drain tubes, infusion tubes, catheters, injection needle and similar, enabling any pressure fluctuations to be identified at an early stage, e.g. needle clogging, micro-bubbles in the fluid or variable pressure feed. 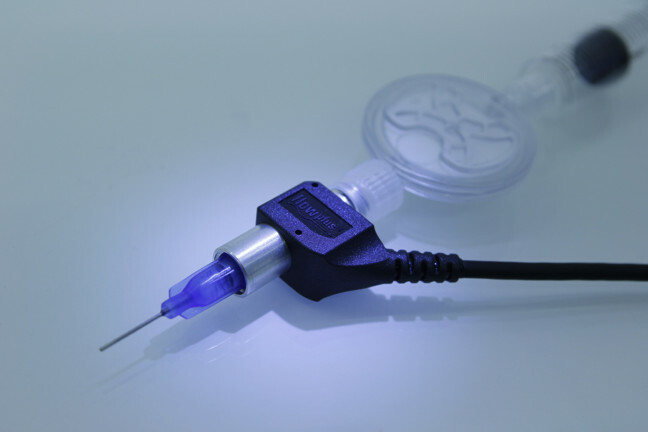 The ISO 594 standardised Luer-Lock system features a 6° cone with 180° twist lock and has been selected by medical bodies throughout the world to facilitate rapid and reliable equipment interconnectivity. Safety is thus greatly enhanced since the flowplus16 can be quickly fitted with confidence, to provide feedback into monitoring and/or control systems, while operating with flows of up to 100ml/min at pressures of 0-16 bar and between 15°C to 45°C. Consequently, when medical processes must be controlled or monitored, e.g. in the continuous conveying of liquids, then the flowplus16 is easy to fit and being pre-calibrated it is exceptionally easy to use. Pressure evaluation up to 16 bar is possible with a high degree of precision via a standardised 0.1 to 10 VDC output signal. This makes the flowplus16 a simple “fit-and-rely-on” item for monitoring process safety parameters. For further information please see www.intertronics.co.uk/flowplus or visit their blog at www.adhere.uk.com–also see www.youtube.com/intertronicsadhere.